London‘s original and genuine retail curtain/upholstery fabric warehouse, ideally situated in Central London. Chelsea Fabrics Ltd import curtains & upholstery fabrics from all over the world & distribute to retail shops and stores throughout the UK. 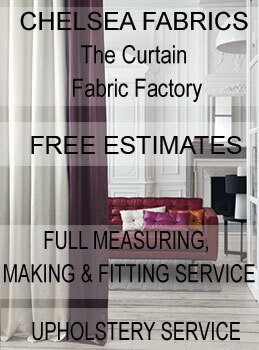 The Curtain Fabric Factory is our retail department and not only sell at substantial discounts but also offer a total package for residential and commercial customers.